1. a person who has withdrawn to a solitary place for a life of religious seclusion. 2. any person living in seclusion; recluse. 4. Ornithology: any of numerous hummingbirds of the genera Glaucis and Phaethornis. 5. a spiced molasses cookie often containing raisins or nuts. 6. a person, who for one weekend a month, puts aside time to stitch in seclusion, with the knowledge that elsewhere in the world, others are doing the same. Ok… So I added #6. LOL!!! 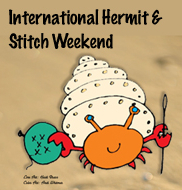 International Hermit and Stitch Weekend takes place every 3rd full weekend of each month, from Friday till Sunday. In our very busy and hectic lives, IHSW is a chance for us to squirrel some time away for ourselves and "Hermit and Stitch." It is a time set aside to take care of us and our love for stitching. 1. A reminder email will be posted on this blog at the beginning of each IHSW week. On the Monday following IHSW, a Sign Up post will go up on this blog. Please link DIRECTLY to your IHSW post of the month to make it easier for other readers to find you. 2. Because of international time zones, the weekend is loosely set to start on your Friday and end on your Sunday night. 3. You can stitch as much or as little as your time permits, on whatever you like, and however you like. 4. You can stitch as many different projects as you like. 5. Post pictures of your weekend on your blog the following Monday (or Tuesday). 6. The sign up list will be in a new post on my blog on the Monday (Eastern Standard Time) following each IHSW weekend. 7. Visit each other's blogs and if you're so inclined, leave a comment. These are always appreciated. Is there a set amount of time I have to stitch to take part? No. You can stitch as little or as much as you want. Do I have to kick my significant other and kids out of the house? 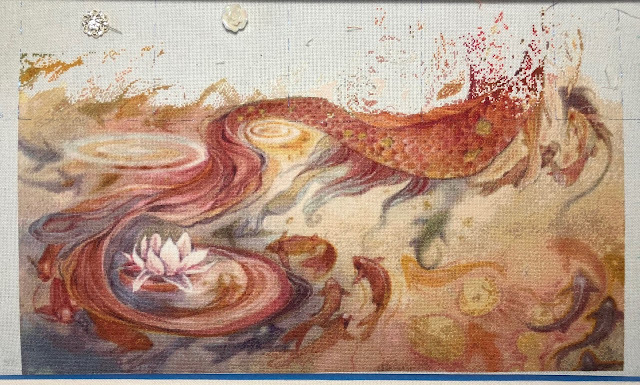 I'm not sure if I'll be able to stitch much, if at all, this weekend. Should I sign up? Can I invite other people to join IHSW? Of course! The more the merrier. :D It would be great if you'd like to promote this on your blogs. Just direct them back to sign up post for each respective month. Also, feel free to display the IHSW button on your blogs. Just copy and paste the HTML located on the sidebar. Does joining IHSW mean I can't blog that weekend? Doesn't the word "hermit" mean solidarity? How can we all hermit at the same time? What if I don't have a blog? Can I still join? Of course you can. Just be sure to include link to your WIPs. Of course, we'd love for you to start a blog... it makes stalking following you that much easier. Do I need to stay in all weekend? How do I get Hermie's icon onto my blog? Copy and paste the code below into your blog. The good: I'm at the happy juncture of 35ish% done and it's time to scroll up!!!! HUZZAH!!!! The bad: Scrolling up leaves me with a huge expanse of (mostly) empty material and damn if my mojo doesn't look at that and want to pull the blanket over its head and go into hiding. LOL! Since this is going to be a picture heavy post I won't say much other than that Martina has created another masterpiece and it looks even better in real life!!! Color conversion by Vanessa M.
I changed her earrings, ring, and tiara to pearls to match her necklace. I, for one, would never be dressed to the nines and have non-matching jewelry. ;) The chopsticks in her hair are stitched with kreinik. The beads on the 'tendrils' of her dress were changed from the original blue to a light lilac. Welcome to my little corner of the online universe. 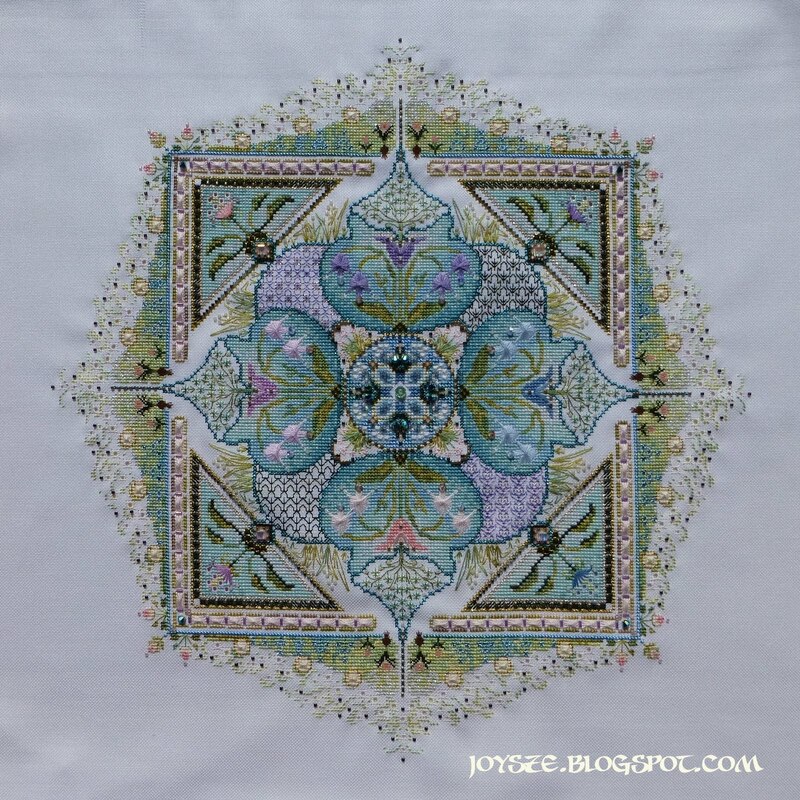 What started as a blog about random goings-on in my life has evolved mostly into a place for me to share my love of stitching and all things beautiful. I am so happy to have your company and please... make yourself at home!